The 2014 Airshow season will be remembered as something a little bit special by UK enthusiasts, but unfortunately all good things must come to an end and this weekends Shuttleworth show will officially bring the season to a close. As I will not be making the trip to Bedfordshire this weekend, my season ended last weekend as I went to the annual Lincolnshire Lancaster Association Members Day, at RAF Coningsby, which really is one of my favourite events of the year and one which is a delightful way to end any Airshow season. 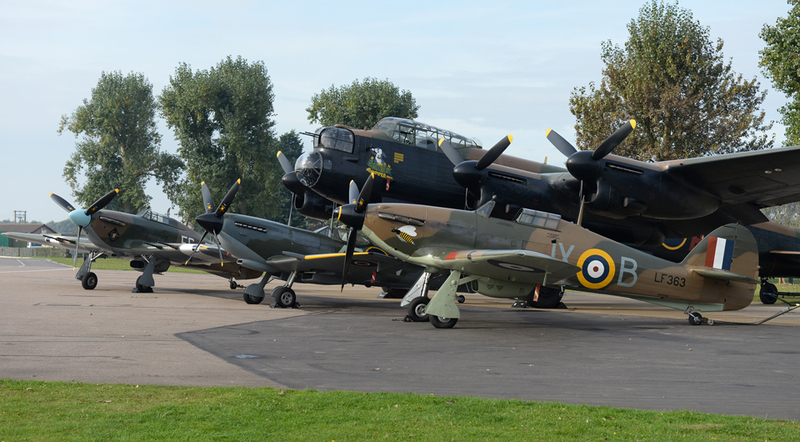 Held at the Battle of Britain Memorial Flight visitors centre each year, Association Members are allowed the opportunity to get close to the magnificent aircraft of the BBMF and the pilots and crew who give up their time to display them for us. In this respect, the day is an opportunity for the BBMF Crews to enjoy some close quarters hero worship and for LLA Members to enjoy a truly unique and quite intimate aviation event. With many veterans and families of former Lancaster aircrew in attendance, this has to be one of the most enjoyable aviation experiences of the year – this year, I went with the specific intention of trying to capture a very specific image, but more on this later. ThumperI have been a member of the LLA for many years now, which I have to say is a very well run and professional organisation. They are a registered charity, who enjoy the unique position of being the official support group for the Battle of Britain Memorial Flight, but with a very specific aim – to keep a Lancaster in the county of Lincolnshire. Known as Bomber County, the Association wish to permanently keep a Lancaster in Lincolnshire as a memorial to the many aircrew who lost their lives flying operations from bases in the county during WWII. After some significant effort in the early years, the LLA managed to achieve it’s aim as Lancaster PA474 moved to Coningsby with the Battle of Britain Memorial Flight, where she can regularly be seen flying in the skies above Lincolnshire, just as they did during the Second World War. As one of the most adored aircraft in the country, PA474 and the LLA go hand in glove and the annual members day at Coningsby is the manifestation of this inexorable link and the efforts of Association members over the years. With valuable support given to the BBMF Lancaster operations, in terms of both finance and the sourcing of extremely rare Lancaster components, the LLA have been a constant supporter of this magnificent aircraft and what it means to the history of Bomber County. At a time when display aircraft are forced to perform further and further away from spectators, the LLA Members Day allows enthusiasts the opportunity to get really close to the magnificent aircraft of the Battle of Britain Memorial Flight, including when the mighty Merlin and Griffon engines are started before the aircraft display. At this years event, I had a specific photograph that I wanted to get, if at all possible – a top surface shot of the beautiful Lancaster, which is something revered amongst aviation photographers. I had obtained maps, spoken to aircrew and devised a plan – all I needed now was for the Lancaster to play ball! Unfortunately, this is something of a fisherman’s tail, as this was certainly a story of the one that got away! I had my position and I was capturing some excellent shots of the afternoon’s display, but I decided to be a bit clever and rush down to the opposite end of the airfield, to capture some shots of the aircraft as they came in to land – surely these would be some of the best shots of the day. I am not too proud to say that I am the chump of the century and that I made the wrong decision – a monumental fail! As I jumped in my car and headed for the opposite end of the airfield, I could see the Lancaster performing the most glorious top surface turn that I had ever witnessed and where was I, in the flaming car! Not content with rubbing my nose in it once, the Lancaster came back for seconds and my glorious plan was in tatters – I had messed up big time! Had I just stayed in the position I was in, I would have had the best pictures of the Lancaster that I had ever taken, in some 35 years of trying and with it, a stunning end to the 2014 Airshow season. Well, you can’t win them all and I suppose that there is always next year! Despite my huge gaff, the latest LLA Members Day was an extremely enjoyable event and I would like to thank everyone involved for serving up such a treat. Next year, it would take wild horses to make me move from my spot! You will recall that one of our recent Newsletters featured an article on the 40th Anniversary of the British Aerospace Hawk, which is one of the most successful aircraft produced by the British aviation industry. We looked at how this much loved aircraft had been produced in quality die-cast collectable models in both the Corgi Aviation Archive range in 1/72nd scale and some stunning 1/48th scale models produced by Squadron Wings. At the time of producing this Newsletter, I had not updated the product images of these 1/48th scale models, but I have recently had the opportunity to put this right and I thought that you might like to see these impressive models for yourself. I have to say that in this larger 1/48th scale, these Hawks are a perfect size and really do look something special – in my view, they are worth every penny of the £69.98 price tag and will always be amongst the most prized models in my own collection. Unfortunately, we only have THREE examples left in stock, with little chance to obtain further supplies – we have two examples of this beautiful black RAF No.208 Squadron machine, from RAF Valley available and just a solitary example of the grey RAF No.151 Squadron Chivenor weapons trainer remaining. If you are a fan of the BAe Hawk jet trainer, these really are the best models around and I am certain that you will not be disappointed with them – snap up one of these very last examples, by clicking on this CLASSIC HAWK link.